Mike Catt is confident England will atone for one of the bleakest days in their history when they collide with Wales in Friday's Six Nations opener at the Millennium Stadium. England were routed 30-3 in Cardiff in 2013 as they slumped to a record defeat in the fixture that destroyed their Grand Slam dream at the final hurdle. Two years older and wiser, Catt draws on last year's victory over Wales at Twickenham for belief as the Red Rose seek to make a triumphant start to the Championship at its most hostile venue. "That day hurt quite a lot. 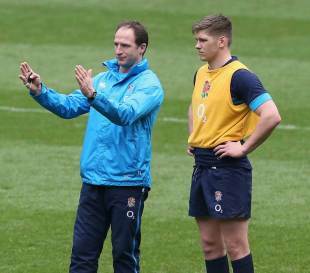 Every English person hurt that day - it wasn't just the team," attacking skills coach Catt said. "It was two years ago. Since then as a team we have been successful against Wales and we are excited. We are looking forward to it. "It won't happen again because we are two years more experienced and the group of players have been in big cauldrons in New Zealand and South Africa. Those things will stand us in good stead." The Millennium Stadium roof is to remain open, a decision determined against Welsh wishes and one that is expected to improve England's chances of upsetting Warren Gatland's men. Blindside flanker James Haskell was on the bench two years ago, coming on to win his 50th cap, and describes the noise levels as an "oppressive force". "Crowds are fantastic in rugby, but often they only pick up in key moments," Haskell told RFU TV. "Down at the Millennium Stadium it's noise before kick-off and noise the whole way through the game. "If the roof is closed and you're 10 metres from the Welsh line, or they're 10metres from your line, the noise becomes so oppressive it's like a force on top of you. "So it's a very intimidating place to go, a very difficult place to get a win. A huge occasion. "In 2013 a lot of players hadn't been down there and played. In rugby it's about experience. Win or lose, you draw from those experiences. "We went there with pretty inexperienced players who hadn't dealt with that kind of situation before and maybe misjudged it. "This time we're going back with a lot more experience. It's about recognising when you're in a difficult situation and recalling what happened before."